Last week I celebrated the birthday of a very dear friend. We have been friends now for thirty five years! Can't belive it - time sure passees fast but the point is I wanted t o do a special card for her. If you read my last post you know that I just moved my craft room and I had a major brain freeze. My papers are in a diffrent place, my stamps and everything else is now out of place. I couldn't do a think, so I called her to confess that I might have to send her a store bought card. My husband is the one I wouldn't dare admit that too! lol But, when I told her I just couldn't think she said, "I love your sheep cards." Well, I had never done birthday sheep, so with that inspiration I headed back into the craft room and got her a card made. Here it is - she loved it and I hope you do to. Once I got the sheep done and felt back in my groove I was able to make this other card using Bloomin Beautiful, Organic Grace and On Your Birthday. This card was garden green and mellow moss. I really like the combo. I used markers to color in the flowers. I really like these sets - sorry organic grace is not still around! We will soon have wonderful new sets to love just as much or more and I'm getting anxious! Just another week and we can begin to order from the new catalog. I've already flagged so many new things, so I'm very thankful we have a whole year to shop from it. I will be sharing from it soon. In fact, a few posts ago I gave a sneak peek and if you look closely you will see another beautiful dragonfly! You know what they say when God closes a door he opens a window! Well, we now have our new dragonfly coming through the window! See you soon! Even though I'm still in Indiana, I have pictures I've never uploaded including our June club - will try to add them later tonight. I'm sure you think I've disappeared for ever, but I'm back with a couple of posts. This one is about my craft room move and my time away from home, then I will post some cards I made last week. I almost got m y craft room completely moved and set up before I left town. Now I need to learn where I put everything so I can get back into the swing of stamping. I'm a visual person and so to no longer know the order of my room is a little disconcerting, but it will be ok once I get home and spend some time in it. I have all of my punches hung up on the wall and I used one of the new decor elements above it. I'm sure it was supposed to be for a child's room, but for some of us the only thing that changes with age is the type of toy. When I get back home I'll take more pictures to upload of the new craft area. I got these racks for the stamps from Ikea. I used them in the other room, but got to spread them out differently here. Thankfully, I'm tall so I can have the top one up hight and still reach the punches. I got the idea from a Stampin' Up! Success magazine. They work great and I got the hanging baskets there too - which are a big help. Before you know it I'll be back home and stamping away! It's been a while since I've posted. To say things are crazy would be an understatement. I'm moving - not to a new house, but to a new room. I'm moving all of my stamping stuff from our study downstairs to a extra bedroom upstairs. Sounds simple, but it's not. First the room upstairs had managed to fill its self with stuff. LOL So I've been sorting and packing up things for keeping, things for throwing away and things for giving away. What a job and why on earth do we think we need to have all that stuff in the first place! The next issue is moving - I need two men without a truck! I made so many trips up and down the stairs yesterday I allowed myself a donut from Starbucks today! The frustrating part of moving is that when you need to do something - whatever you need is where you're not. Yesterday was Chat & Challenge on SUDSOL. I love participating in these - I get to meet the most interesting women as we chat and stamp. One of the most fun parts of stamping has been the new friends I've made both local and all over the country/world. Yes, world - most recently I've been conversing with a stamper in Australia. Well, back to yesterday - I had a blast except that I went back and forth the entire hour trying to find the things I needed, as I said what I needed was never where I was, but I got my card done. I used all new materials for this card. We have been given the opportunity to purchase a few items ahead of the new catalog - it's called Sneak Peak and I purchased a level 2 Hostess set and the new In Color papers and inks. I love the new colors, even though I'm still very sad at losing Kiwi Kiss and the other current colors. 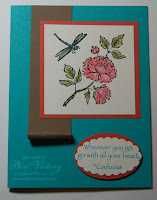 For this card I used Asian Artistry as the stamp set and Dusty Durango, Soft Suede, Bermuda Bay and Very Vanilla. One of the most exciting things for the new year - we now have markers for our In Colors! The only problem is that in the midst of my move and the confusion of my stuff, I forgot them and used Cameo Coral to color the flower. Looks pretty good though and that's one of the many wonderful things about Stampin' Up - the colors work together beautifully. I really enjoyed using this set and look forward to showing you the other stamps in it over the next few days. Check back soon, hopefully I'm back on schedule. As we all know I'm having a blast with sheep! Last night I finished my Christmas Sheep. I decided that I needed some little lambs to go with Santa & Mrs. Claus. I added some snow to the ground (if you lived in Houston, as I do, you would know that when we do have snow it is on green grass) I borrowed the Sock Monkey's Santa cap, made the scarf for Mrs. from two circle punches and of course the lambs caps are our retired 3/4" square cut on the diagonal and the 1/4" circle hand punch. The bodies of the lambs were punched with the Boho Blossoms largest flower and unfortunately the head and feet were punched with the retired (1/08) small five petal flower from the Spring Flower Bouquet. I am sorry that so many of our little punches have retired. We always need a small square and a 1/4" circle , hopefully if you want to make this and don't have these punches you can cut them out by hand. 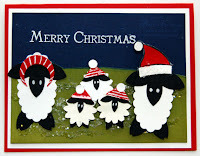 I hope you will enjoy these sheep in the spirit of Christmas. Now it's your turn - get out your punches and have fun!